'No Man's Land' runs Tuesday–Sunday through August 31 at Berkeley Repertory Theatre. 2015 Addison St., Berkeley. Times vary. Sold-out. 510.647.2949. 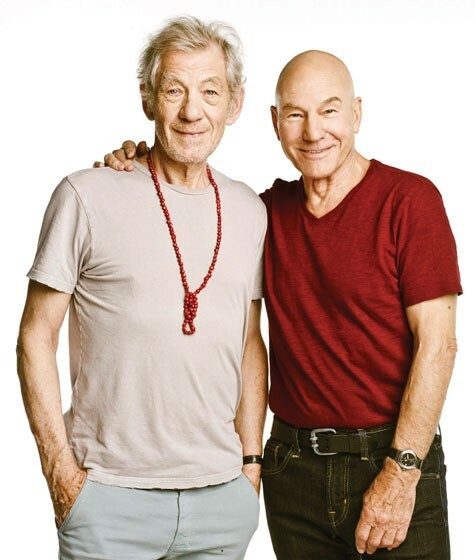 ALCHEMY Ian McKellen and Patrick Stewart in the theater event of the year. Absurdist playwright Harold Pinter enjoyed putting his characters into situations where at least one of them has no idea what's going on. That same sense of uncertainty and confusion is often experienced by Pinter's audiences, who, like the character of Spooner in 1975's No Man's Land, must give up whatever expectations they had upon entering the room and simply find a way to go with the flow and enjoy the mystery of it all. Pinter, who died in 2008, would no doubt enjoy the added dimension of absurdity in the new production of No Man's Land, running through Aug. 31 at Berkeley Repertory Theatre before moving to New York City for a run on Broadway. The production features a quartet of fine actors known across the globe for their appearances on television and in blockbuster movies: Ian McKellen (The Lord of the Rings, X-Men), Patrick Stewart (Star Trek: The Next Generation, X-Men), Billy Crudup (The Watchmen) and Shuler Hensley (Van Helsing). Though accomplished stage actors all, the enormous celebrity of the No Man's Land cast will certainly attract unsuspecting ticket buyers unfamiliar with Pinter, sure to be baffled by the play's plotless nonspecifics and forced to find satisfaction where they can. They will find it, of course, in the brilliantly sly, comically rich performances of the actors, especially Stewart and McKellen. But if they also surrender themselves to the jam-thick joys of Pinter's flavorful language and the thrills of the play's where-are-we-going elusiveness, first-timers might also find themselves having a great time with the play itself. The "action" takes place in a large room at the opulent English manor of the wealthy alcoholic Hirst (Stewart), where a somewhat shabby stranger named Spooner (McKellen) has been invited for a late-night drink—a few too many drinks, it turns out. As Hirst sits in a stupor, Spooner spins a self-aggrandizing tale that stretches credibility but demonstrates his elastic gift for eccentric oratory. Eventually, Briggs (Hensley) and Foster (Crudup)—Hirst's thuggish aides—enter the picture, immediately wary of Spooner, whom they suspect of . . . it's never clear what. Spooner's ability to improvise explanations soon comes in handy, as Hirst, once sobered up, proves to be equally deft at spinning outrageous tales—though in his case, he actually appears to believe his own delusions. Staged with humor and stylized dread by Sean Mathias, No Man's Land is pure Pinter Land, maddeningly short on answers, but packed with entertaining, pleasantly intangible questions.